If you have been in this hobby for a while, you will likely have amassed quite a collection of RC models and not necessarily all of them bound to the same radio control, so probably a collection of them too. That's where this multiprotocol TX module will come in handy. It incorporates four RF chips into one transmitter module and supports pretty much all of the communication protocols used in the RC hobby so that you can control everything from a single radio; from toy grade Syma models to FrSky racing drones or Spektrum BNF aircraft. The module is designed to work with transmitters that operate with OpenTX 2.2.X, so all FrSky transmitters and other brands too. 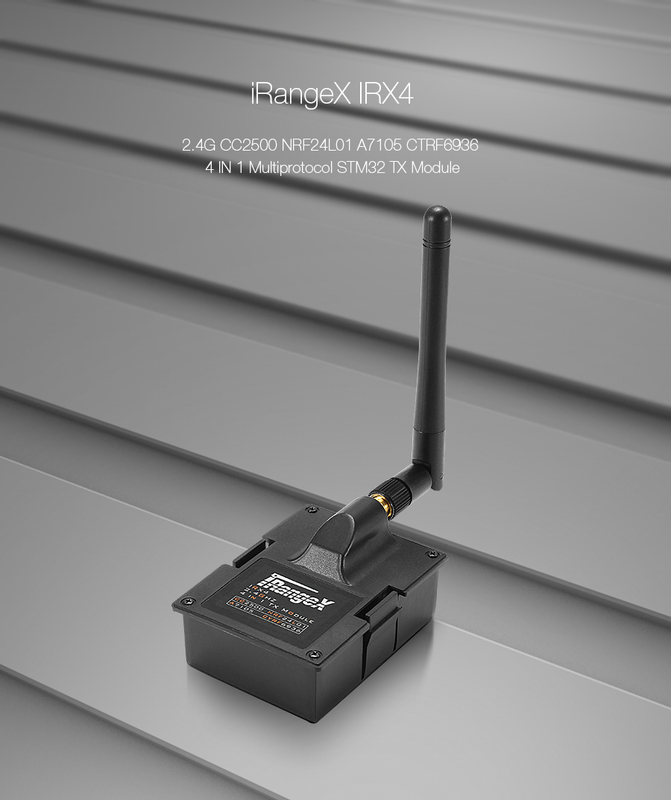 OpenTX 2.2.X has special support for the iRangeX IRX4 that allows the protocols to be easily selected from the transmitter SETUP menu or Companion. This particular Multiprotocol Module features a STEM32 microcontroller (MCU), which has enough on-board storage space to store all of the protocols you need without having to re-flash it.